Ugh, so many sharps. Eventually you learn them by heart. Like – but of course one sharp is G major. Also e minor. But to get there you need some tools. The circle of fifths is one such tool. But you need to move on from there. You don’t have time to draw a circle (even in your mind) every time. 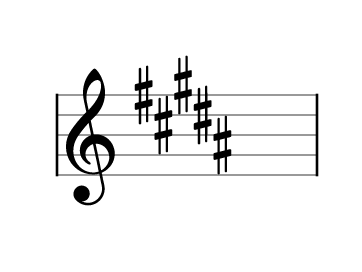 So this post gives you two ideas to figure out key signatures without resorting to the circle. Back to the example. What on earth can this possibly be? And let’s start with majors first. You know how to traverse the circle of fifths and go F (forget it), C is 0, G is 1, D2, A3, E4, B5. Aha – B major! But here’s a quicker way. Look at the last sharp. It’s A♯. Raise it by half step. Here’s your answer – B major. Yup, that simple. Raise the last ♯ half a step. And bear the sharp in mind. You’re raising A♯ not A. What is the last sharp? F♯. Raise it by half a step. G major. Boom! Another? With all the sharps? 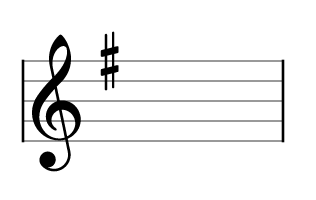 The last sharp is B♯ (same pitch as C). Raise is by half? C♯. There you go. Nice, it works! How about the minors? A minor key has the same flats and sharps as the major which is a step and a half above it. 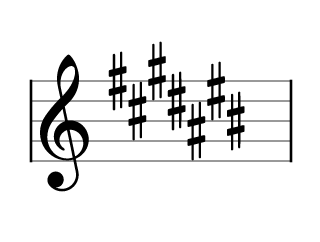 A minor has 0 sharps and flats, just like C major. E minor has one sharp like G major. Theoretically if you know your majors you can derive the minor, just lower it a step and a half. But that’s doing two things. There’s a shortcut where you only do one thing. Fewer possible points of failure. F♯. Lower it a whole step – E. Answer: E minor. The last sharp is B♯. Lower a step. A♯. Here’s your answer. A♯ minor. A♯ is the last. Down a step – G♯. G♯ minor – last and final answer.